A black (artificial) silk dress is suibable for afternoon wear, but it’s also suitable for the office. 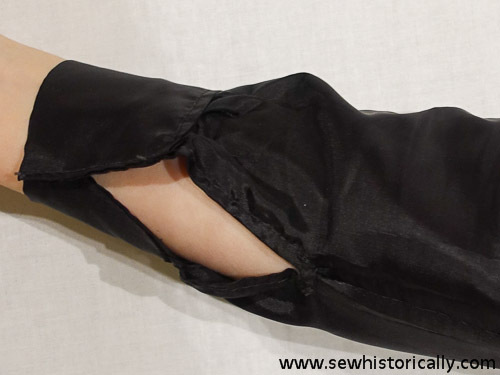 For my black dress I used black cellulose acetate fabric, which was called celanese in the 20s (1926 celanese dress). 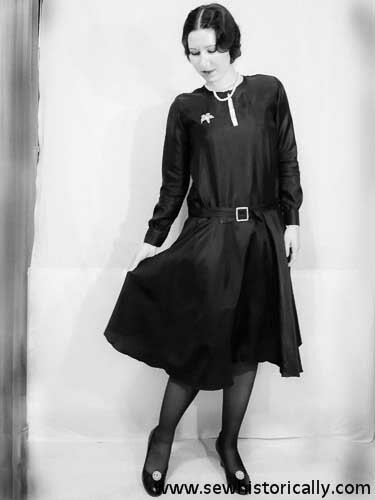 Here are interesting 1920s office photos of working women and their dresses. 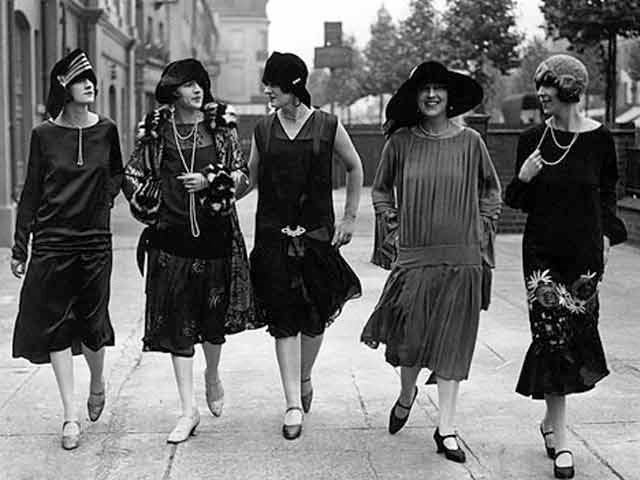 These two dresses were my main inspiration: 1920s black silk satin dress (note the rhinestone brooch at the hip), and this 1920s photograph: the woman on the left wears a very similar dress. 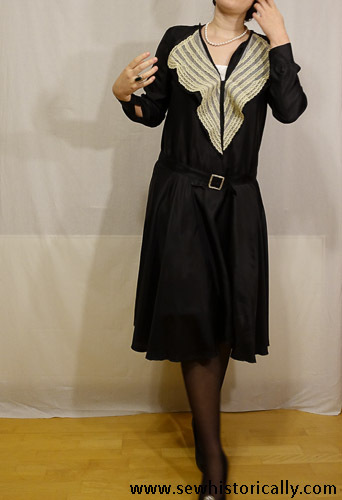 Here’s a long-sleeved black dress and a 20s photograph of a dress with circular skirt. The back of the dress is just a large rectangle. While the front is a short rectangle with a circular skirt. The dress has a hook and eye closure at the neck. 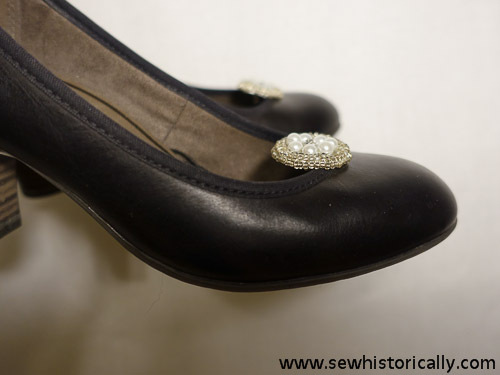 The cuffs are based on the 1928 movie ‘Champagne‘ – a silent film directed by Alfred Hitchcock – the cuffs of a plain black dress are seen at about 32:20. If the dress is worn as afternoon dress, it’d be accessorized with necklaces, brooch, collar and cuffs etc. 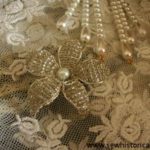 So I made a crystal beaded flower brooch and beaded belt buckle for the dress. 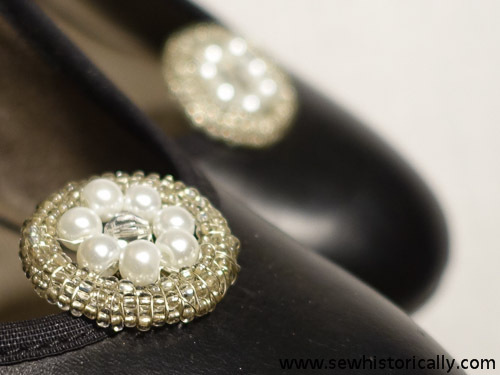 … and my DIY beaded shoe clips. 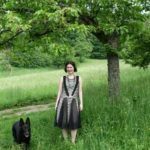 I made two different lace collars for the dress. 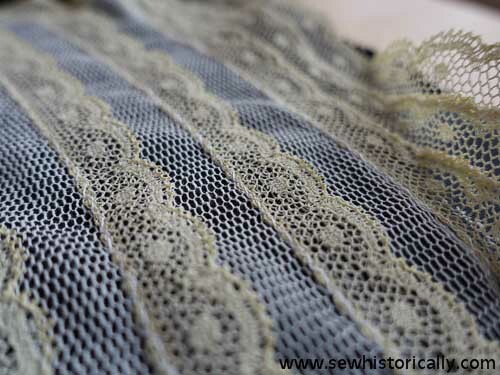 For the first one I used cream-colored cotton Valenciennes lace and cream-colored cotton bobbinet tulle (the same tulle which I used to make my Victorian day cap). 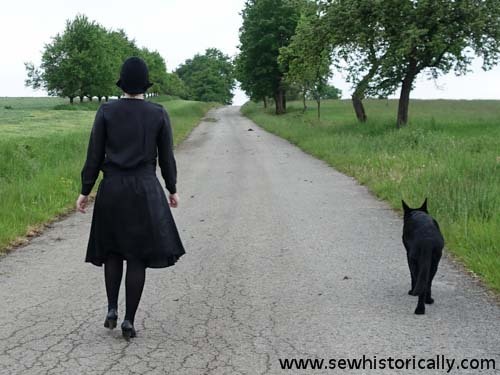 The V-collar has two layers: a black one and the tulle and lace collar on top. 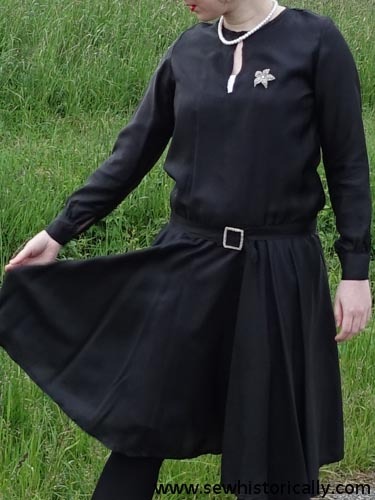 The edges of the black collar are finished with my 1920s imitation picot hem. 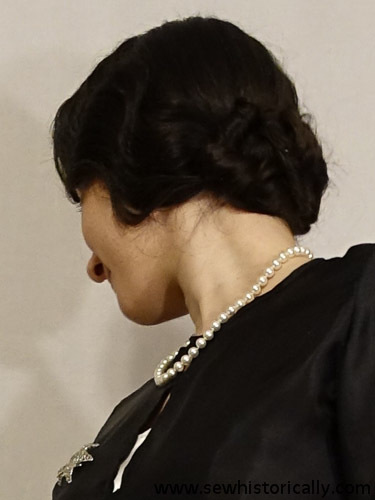 The collar, dress and hairstyle is inspired by a fashion plate in the Fashion Sourcebook – 1920s. Here’s a similar 1926 fashion plate of a black dress with flounced white v-neck collar. 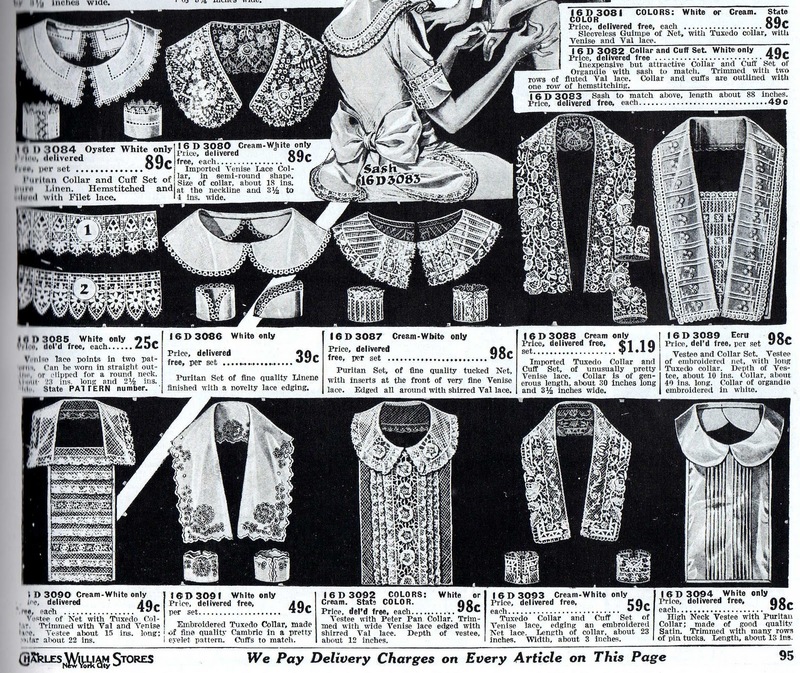 And some 1920s ads for white and cream-colored tulle and Val (Valenciennes) lace collars. And an antique 20s dark green silk velvet dress with large lace collar. The other collar is a white tulle lace collar. 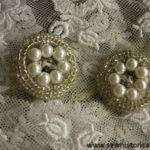 I used two pieces of torn vintage tulle lace (here are details how I repaired the lace). 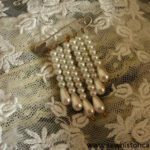 I also made matching lace cuffs. 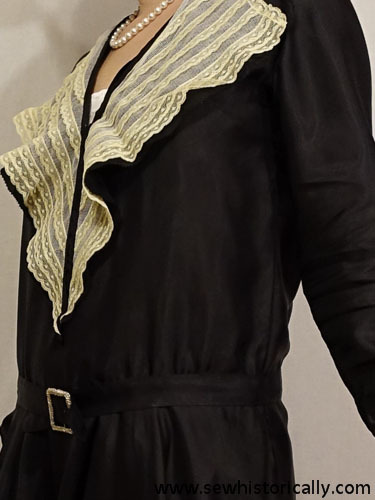 This 1920s photograph of a woman (note the shoes and shoe clips) with black dress and lace collar and cuffs inspired me to make this lace collar and cuffs. I pinned my long hair into a faux bob. 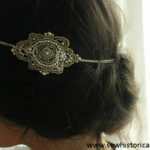 Here’s my tutorial how I made this authentic 1920s hairstyle. 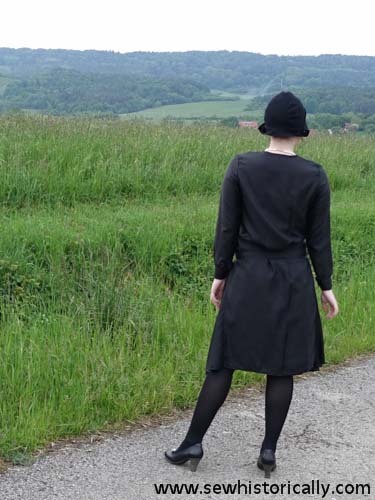 With the dress I’m wearing my 1920s black wool cloche hat. Beautiful work. I love it! I like to get inspiration from classic films.